REYKJAVIK, ICELAND— EVE Fanfest 2014 marks one full year since the debut of the original EVE-VR prototype. 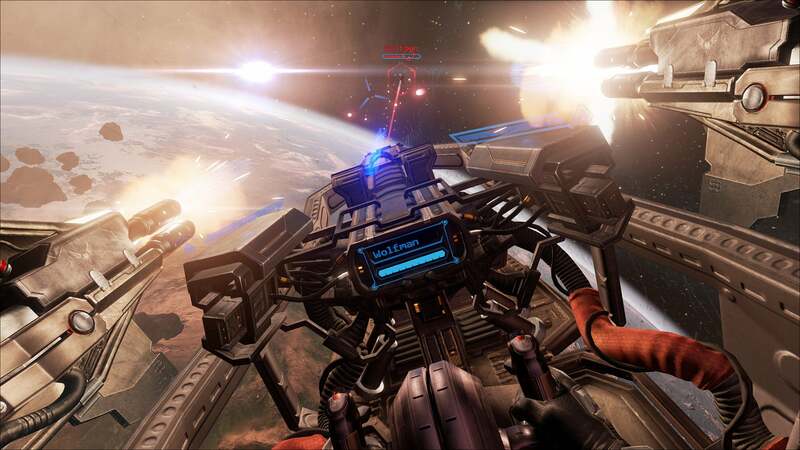 It's hard to believe that in that scant time we've seen EVE-VR turn into a full-fledged project at CCP, gain a new name (EVE: Valkyrie), become an Oculus Rift launch title, debut on Sony's Project Morpheus headset, take advantage of Oculus Rift Dev Kit 2's positional tracking features, and add multiple ships for tactical depth. Yes, it's been quite a year—and the improvements aren't done yet. At Thursday's EVE: Valkyrie keynote at the annual EVE fanfest, CCP announced that the game is moving over to Unreal Engine 4. Most of the Valkyrie team was previously on CCP's first-person shooter, Dust 514, so they were used to Unreal already and felt it would be beneficial to move away from the game's previous engine, Unity. The other big announcement: CCP is bringing Katee Sackhoff on-board as a voice actor. You probably know her as Starbuck from the acclaimed Battlestar Galactica reboot, though she also did voicework for Halo 3 and plays an important role on Longmire. Sackhoff will be voicing the role of Rán, leader of the Valkyries. "The first time I played EVE: Valkyrie I immediately knew I had to be a part of it,” said Sackhoff in a prepared CCP statement.“Even with the roles I have played, it is the closest I have ever felt to being a real spaceship pilot." I got some hands-on time with the Sackhoff- and Unreal 4-enabled build today. To be honest, it was hard for me to discern a graphical difference between today's Unreal 4 build and the old version I played at GDC in March—Valkyrie was already one of the most beautiful Rift games even in its previous installment. Senior programmer Sigurður Gunnarsson told me the biggest boon at this point is Unreal's lighting engine, which is a huge improvement over Unity's. Sackhoff's role is fairly rudimentary thus far. The Valkyrie demo now kicks off with her filling us in on some background information—prior to the mission start, Rán told us we had to protect a group of ships from marauders for three minutes. Afterward she came on every minute to tell us how much time was left. It's not much of a hook yet, but her involvement indicates CCP is serious about fleshing out the game and turning it into a full experience. 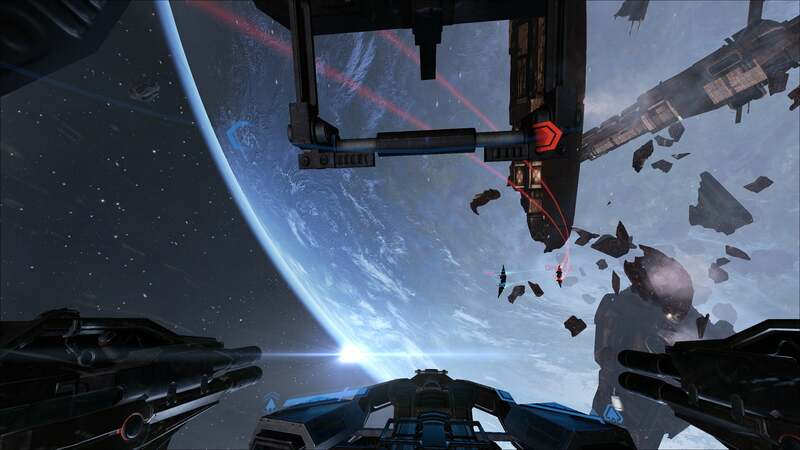 What that EVE: Valkyrie experience will entail—well, that's the real question. Where does EVE: Valkyrie fit in? EVE-VR got out of the gate first, showing us what virtual reality is capable of. But space simulators Elite: Dangerous and Star Citizen are on the horizon, and both those games have defined a role for themselves—Elite as a true successor to its classic space sim predecessors and Star Citizen as some sort of hybrid simulator/life replacement. What's Valkyrie's role? Though there have been rumors about Valkyrie eventually tying into EVE Online, a la Dust 514, or becoming a massive game in its own right, CCP still claims it's simply a multiplayer-only, combat-focused, arcadey space game. And that's not a bad thing. "I think we're going to have a little bit of an edge. We are making the VR experience the primary experience. We don't have to worry about, 'Yes, this works really well in VR but how would it work on a normal monitor,'" says Gunnarsson. "A lot of people think we're entirely nuts for doing [only VR]," Gunnarsson says, laughing, "But we really think this is going to be the next big thing. We know what our partners are doing, and we're really excited for what's coming down the line." There's still more coverage of EVE Fanfest ahead—check back tomorrow for news regarding EVE Online and Dust 514.